There didn’t seem to be a basic gloox tutorial available, and the example on their home page is out of date, so I decided to write one. This tutorial is based on their example, but extended and updated to work with gloox version 1.0. Since you are reading this, you probably already know, but gloox is a popular library for the Extensible Messaging and Presence Protocol (XMPP), formerly known as Jabber. In this basic tutorial I will demonstrate how to create an XMPP bot that connects to a server (using TLS), listens for messages, and answers them in an annoying way. If you just want the code, get bot.cpp from GitHub, compilation instructions are at the top of the file. The first thing we need to do is set up a MessageHandler. This will connect to the server, and handle incoming messages. 5: Here we create the client, with our ID and password. 6: We need a ConnectionListener to handle connections, I will get back to that later. 7: The Client needs a MessageHandler to handle incoming messages. Since the Bot itself inherits from MessageHandler, we just pass this. 8: The ConnectionListener must also be registered with the Client. 9: Finally we connect to the XMPP server. There are two ways to connect, blocking and non-blocking. In our example, we use blocking connections. If you go for non-blocking, you need to call Client::recv() at regular intervals to receive data. 2: Print the received message (using a custom operator<<). 3: Create a new message to whoever sent us a message, asking them to tell us more about this fascinating subject. 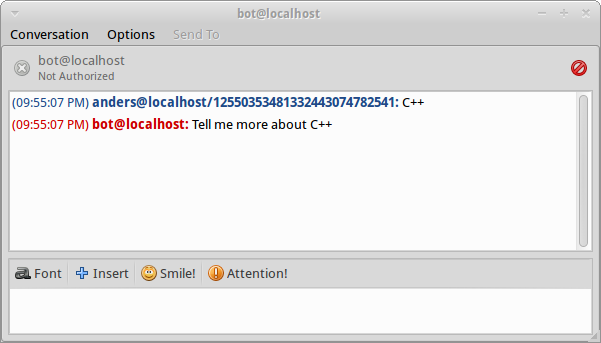 4: Send the message, using the Client we created in the Bot constructor. Here I just cout the names of the methods when they are called, to see that everything works. If there is an error, onDisconnect() displays the error code. The error codes can be found in gloox.h. The main method to pay attention to is onTLSConnect(). This should check the TLS cert credentials, and return true if they are accepted. In this tutorial we accept whatever we get. That’s it! Get the full code from GitHub. To compile, you need to install gloox and pthreads. On Ubuntu, gloox is installed doing sudo apt-get install libgloox-dev, pthreads should come with your compiler. To compile using g++, do g++ -o bot bot.cpp -lgloox -lpthread. Other Linuxes should be similar. On Windows, download and install from http://camaya.net/gloox/download, and read the included documentation. To test this, I installed ejabbered. If you are using Ubuntu, there is a simple, good tutorial available. As soon as ejabberd is installed, visit http://<servername&gt;:5280/admin/server/localhost/users/ and add the user “bot”, with password “botpwd”. Also add another user to play the other part of the conversation (I used “anders”). There are many XMPP clients available, I used Pidgin (sudo apt-get install pidgin on Ubuntu). After installing, open the main window (“Buddy List”) and select Accounts -> Manage Accounts -> Add. Select protocol “XMPP”, the other username you created on your XMPP server (not “bot”) and a domain (“localhost” if you are running on localhost). On the Advanced page, select port “5222”, server “localhost” (or whatever host you are running on). Click “Add”, and tick the “Enabled”-box in the list of accounts. Hit “Close”. Now go to the Buddy List again, select “Buddies”, “Add Buddy”. In “Buddy’s username”, enter “bot@localhost” (or whatever host you are running on). If you have started your bot (./bot on the command line), you can now double-click on the bot in you Buddy List as you would normally do to chat with someone in any IM program, and type your message. If everything went according to plan, the bot will be very interested, and want to know more!